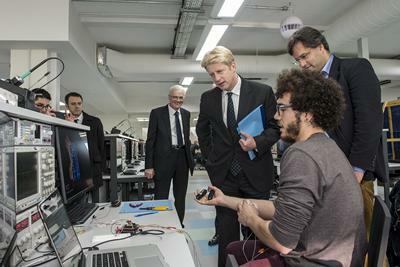 Jo Johnson MP, the Minister of State for Universities and Science, formally opened two world-leading research and teaching facilities at the University of Southampton today (23 November). The Minister officially opened the new experimental fluid dynamics building on the University’s £140m Boldrewood Innovation Campus. The building hosts world-class research infrastructure including an anechoic wind chamber, advanced fluid dynamics experimental facilities and a 138-metre towing tank, which will be used across a range of disciplines including aerospace, civil engineering, infrastructure and maritime engineering. He also opened the recently refurbished multi-million pound Teaching and Computing Laboratories for Electronics and Computer Science (ECS), which will ensure current and future students will use the latest technology and state-of-the-art facilities to support their degree programmes and prepare them for industries of the future. A £4m investment, funded by the University and the Higher Education Funding Council for England (HEFCE), enabled the undergraduate and MSc labs for Computing and for Electrical and Electronic Engineering to significantly increase capacity and enhance capability. 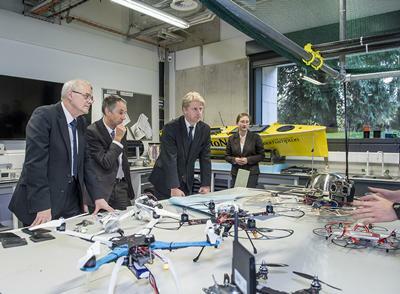 This included the creation of a new 300m2 project lab for senior undergraduate and MSc students. 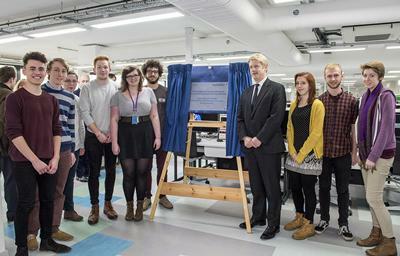 Universities and Science Minister Jo Johnson said: “It was a pleasure opening the new Fluid Dynamics lab and the impressive Teaching and Computing Laboratories at the University of Southampton. During the opening of the Teaching and Computing Laboratories labs, ARM, the world’s leading semiconductor IP company, announced its continuing commitment to a partnership with the University with a further three years of funding to the ARM-ECS Research Centre. The Centre, founded in 2008 following successful research collaboration over a number of years focuses on leading-edge research on advanced design methods, architectures and their practical applications for energy-efficient and dependable processor systems. The partnership between ARM and the University of Southampton was recognised last week (19 November) with the University Research Group of the Year Award at the NMI Awards in London, UK. As the UK and Ireland’s Electronic Systems Industry association, NMI annually award and showcase excellence within the industry rewarding the innovation, expertise and ambition of businesses.